The Burchfield Penney Art Center will host a lecture with living legacy artist and Buffalo State alumnus Richard Kegler, '88, on M&T Second Friday, June 10, at 6:00 p.m. in the center’s Collection Study Gallery. The event celebrates the release of Kegler’s new book, The Aries Press of Eden, New York, published by RIT Press. 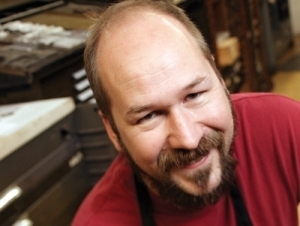 Kegler is the director of the Wells College Book Arts Center in Aurora, New York. He founded both the P22 Type Foundry and the Western New York Book Arts Center in Buffalo, New York. He is a letterpress printer and book designer with a long-standing interest in printing history. In the book, which ​includes a foreword by Burchfield Penney executive director Anthony Bannon, Kegler uncovers an almost lost history of the Aries Press. Spencer Kellogg Jr., a businessman and book designer, founded the Aries Press in Eden, New York, during the 1920s with a vision to produce high-quality book designs. Kellogg hired talented workers with a passion for printing, including a craftsman connected to the nearby Roycroft campus. He also commissioned type designer Frederic Goudy to create a typeface for Aries Press. While the press was only open for four years, it produced many fine standard-setting examples of printing. In 1926, the first book printed at the Aries Press, The Ghost Ship, by Richard Middleton, was named one of the 50 best-designed books by the American Institute of Graphic Arts. To uphold the high-quality printing values of a private press, no more than 300 copies of a book were printed. The Aries Press was also known for its connections to William Morris, Rockwell Kent, and Bruce Rogers. Kellogg purchased his printing press from Frederic Goudy. It was later known as the Kelmscott/Goudy Albion Press and was acquired by the Cary Graphic Arts Collection in 2013. Printers, print historians, and typographers will enjoy the Aries Press story, as will anyone with an interest in Western New York history. The colorful examples highlighted in Kegler’s book provide inspiration for today’s contemporary designers. M&T Second Friday's, held the second Friday of every month, feature openings and happy hours, programs, concerts, screenings or other special events. On June 10, the program includes Kegler's lecture, a Guitar Day concert presented by the BPO, and a performance from violinist David Adamczyk and tabla/multipercussionist Ravi Padmanabha.